My father opened our travel agency over 55 years ago. Today we are booking the grandchildren of the honeymooning couples he booked back then. One of our specialties is group bookings, large and small, so we love to book family trips. The internet is a good source of information, but I can’t tell you how many times people come into our office to inquire about a trip and after speaking with one of our travel consultants for 15 or 20 minutes, they reveal, “Wow. You just told me in a few minutes what I spent hours on the computer researching last night.” Usually their spouse then rolls their eyes, as an “I told you so” gesture. I love when that happens. From time to time, we are visited by elderly clients, now unable to travel, who all seem to have the same message. The trips we planned for them provided some of the best memories of their lives, especially the vacations we booked for their families. While it is quite fulfilling to know that our efforts and daily grind in the office have enriched lives in such a way, it also inspires us to continue to ensure that we find the perfect vacation for our clients and their families. I’d like to share some of the recommendations from our great group of travel consultants in this article, but you have to promise not to take this information and go to your computer to book this yourself. We have the same rates as your computer, and we don’t charge any fees to book your vacation, so do the smart thing and contact us directly. Deal? 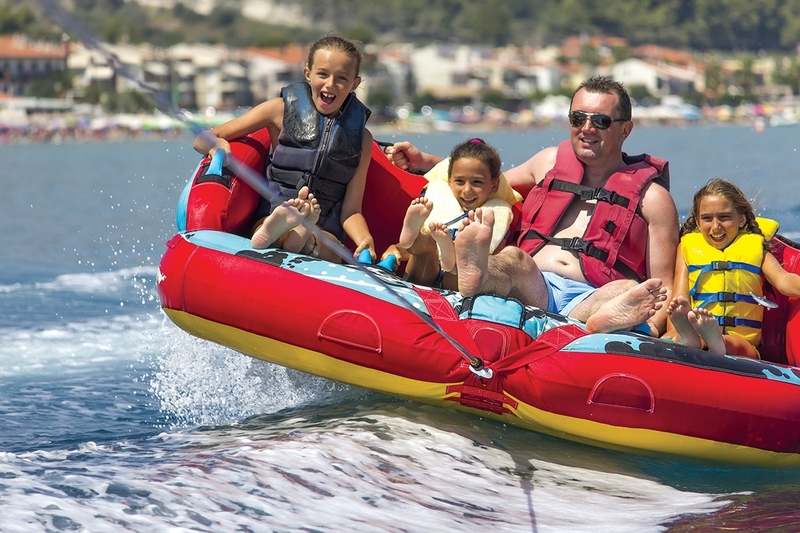 Cruises offer great family vacations, appealing to all age groups. While most people with young families immediately think of Disney Cruise Lines, there are more affordable options. We like to suggest some of the other cruise lines such as Royal Caribbean and Norwegian Cruise Line. (Don’t tell our Disney Cruise sales representative.) Besides visiting some great ports, Royal Caribbean offers a variety of programs on select ships for younger children, like sharing moments with their favorite characters from Shrek, Kung Fu Panda, Madagascar, and other DreamWorks Animation films at character dining, shows, 3D movies, photo opportunities and surprise appearances. For kids a bit older (like my husband) they offer complimentary features like the FlowRider® surf simulator, rock-climbing wall, ice-skating rink, carousels, zip lines, and more incredible innovations — included in the price of your cruise. One of our agents just returned from her own family vacation on Royal Caribbean’s Allure of the Seas. Our agents like to travel, too. And there’s nothing like firsthand experience. Like other cruise lines, Norwegian Cruise Line offers their Splash Academy with activities such as Circus School, Treasure hunts, arts & crafts all segmented by age groups of 3 to 5, 6 to 9 and 10 to 12 years old. Their Entourage program appeals to ages of 13 to 14 and 15 to 17 with movies, team-building challenges, video games and pool parties. Depending on your family dynamics, everyone in your group can enjoy the days on their own and you can all get together for dinner at the end of each day to share your experiences, or spend the days together if you all actually get along. All of the meals and so much entertainment is included, and cruise lines are always running promotions. Norwegian Cruise Line often offers a deal where the third and fourth passenger in a cabin is free. In case you’re scanning, let me catch your eye I said FREE. Hey, remember our deal. I’ll keep going here, but stay away from that computer. All-inclusive resorts are also very popular with families. Some are geared more for couples, some for singles and some for families, so it is important that you end up at the resort best suited for you and your travelling companions. Don’t worry. We won’t send your family to a swinging singles resort. Located throughout the Caribbean, Central America, the Bahamas and Mexico, some of our favorites are Beaches, Dreams, Iberostar, and Barcelo resorts, with a range of programs for kids of all ages, including unlimited land and water sports. Some offer two and three bedroom units, which are great for families. For example, one of our agents recommends the Iberostar Paraiso Lindo/Maya which has a lazy river and a wave pool. Barcelo Palace Resorts offer a kids’ waterpark right on their own properties. As with the cruise lines, there are sometimes promotions at all-inclusive resorts for up to two children under 12 to stay free. Yes, there’s that FREE word again. If your family is on the adventurous side, there are companies out there just waiting to provide you with an experience you’ll never forget. One of our favorite adventure travel suppliers offers trips for small groups (with a minimum of 8 participants, between the ages of 4 and 90) throughout the United States and around the world. Featuring such interests and activities as hiking, biking, kayaking, rock climbing, dog sledding, white water rafting, horseback riding and more (or less, as you wish), there is something for everyone. These journeys are an opportunity for your family to learn and grow while creating a memory they will carry with them for the rest of their lives. This brings me to my final point. So many people I know get stressed over the holidays with the dilemma of what to buy their children and or grandchildren, parents and grandparents. I have to wonder how many people can actually recall what gifts they received, or gave for that matter, over the years. A family trip will be remembered for life. Picture your family when they look into their stocking and find an envelope. Inside is a brochure with a note that a vacation has been planned. The excitement will build until the day of the trip, when a journey of a lifetime begins. And, they will be forever grateful. Who needs more electronic gadgets or exploding hoverboards? (Yes, I know, scare tactics are a cheap shot, but you get the message.) Start thinking about what might appeal to your family, and then contact our office. Chances are our travel consultants have been where you want to go, and they’re very good at what they do. Klingerman Travel is located at 301 Flanders Road, East Lyme. For more information, visit klingermantravel.com or call 860-739-0043.